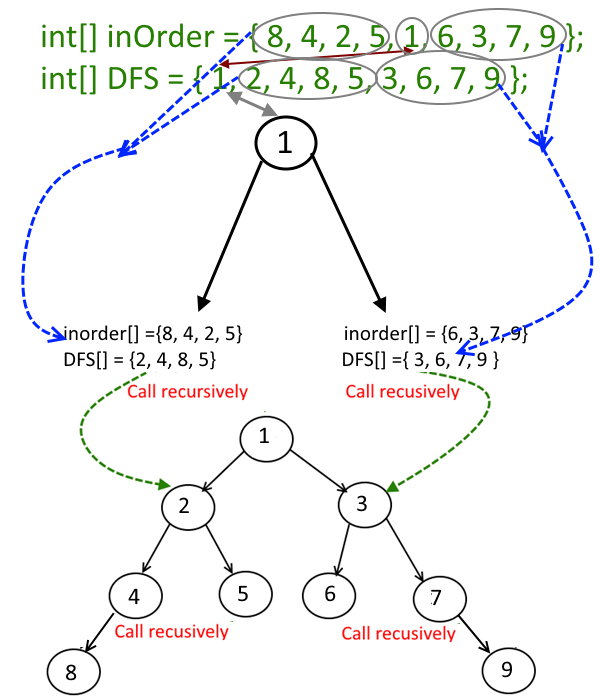 Construct a Binary Tree from Given Inorder and Depth-First-Search. Objective: – Given a inorder and pre­order tra­ver­sal, con­struct a binary tree from that. Input: Inorder traversal and Depth-First-Search. First element in DFS will be the root of the tree, here its 1. Now the search element 1 in inorder, say you find it at position i, once you find it, make note of elements which are left to i (this will construct the leftsubtree) and elements which are right to i ( this will construct the rightSubtree). See this step above and recursively construct left subtree and link it root.left and recursively construct right subtree and link it root.right. See the picture and code.